Buenos Dias, it’s Chili Time! When I was in college my mother joined Weight Watchers and as a result of her amazing “2 Point” chili recipe she procured from the group I lost 30lbs in my freshman year. 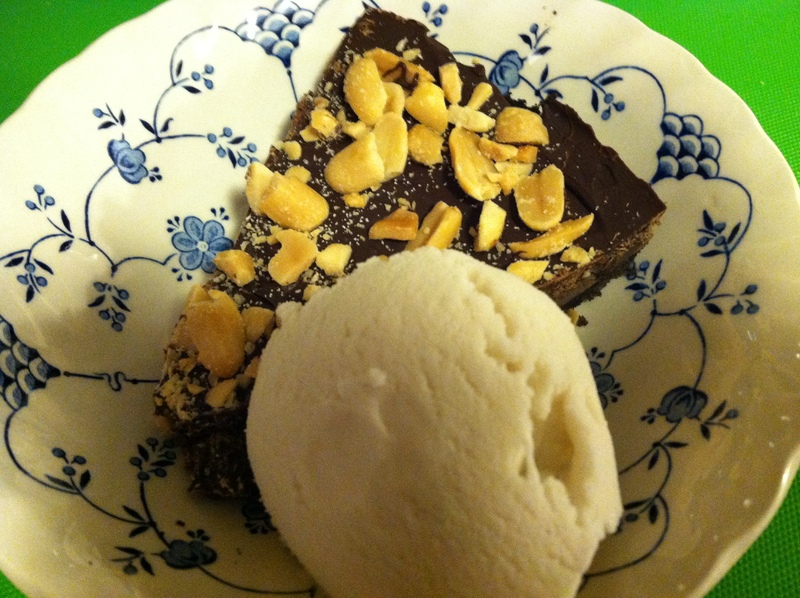 It was THAT good and oddly THAT healthy and definitely THAT easy to make. I call it a “DUMP” recipe. Most stuff just gets dumped in a pot or pan and VOILA! 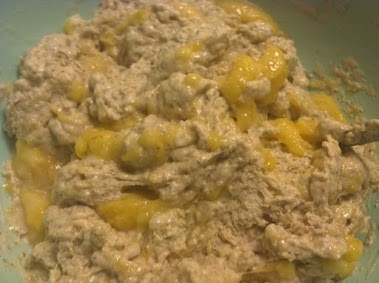 However it has ground turkey and powdered milk in it so I had to remake that delicious recipe for myself this past year. 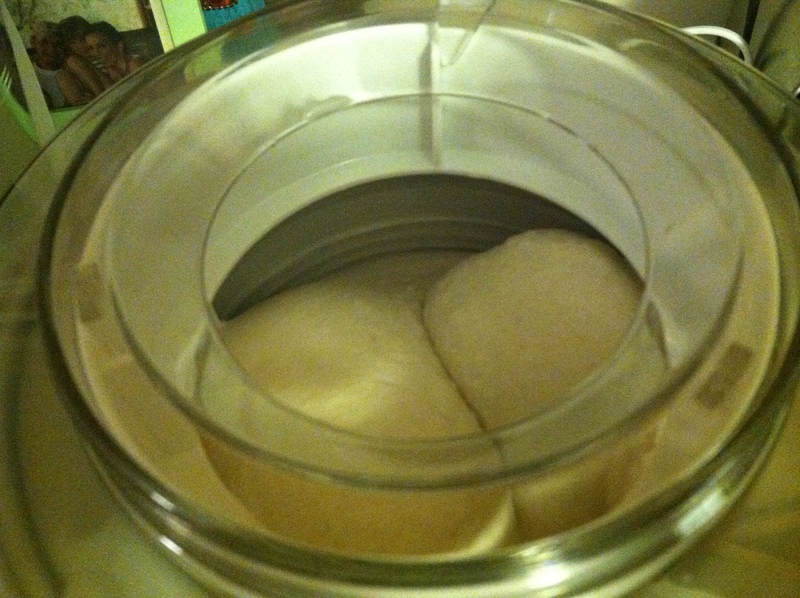 Making it without the turkey was okay and the powder being omitted didn’t phase me but I needed more bulk. So I would like to thank Tofurky once again for their delicious ground bits that are supposed to be similar to ground hamburger meat. 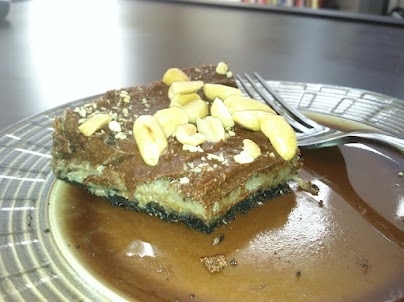 This bulked it up and made it a staple in my home again! Place Tofurky Meat, oil, and salt into the bottom of a large sauce pan (like one you would make a gallon of tomato sauce in!). Cook on Medium High until oil has mostly cooked off and the meat has cooked down. 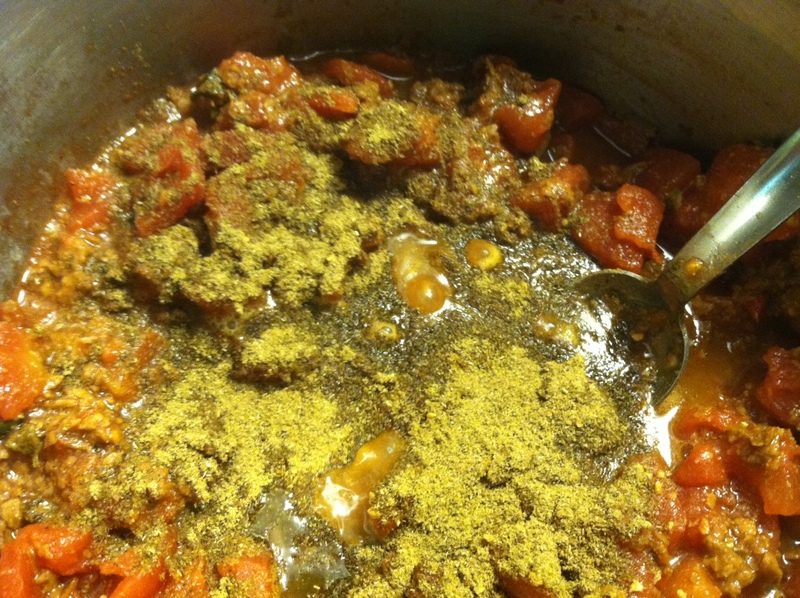 Add additional “meat” spices listed and toss until everything has combined and cooked down. Next, begin adding Veggie mixture adding the tomatoes and beans first. 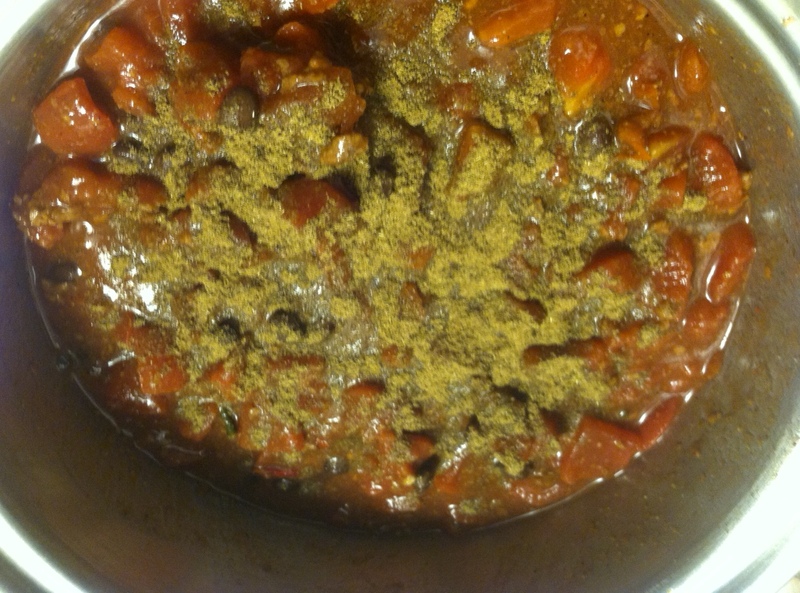 Then slowly begin mixing in spices. 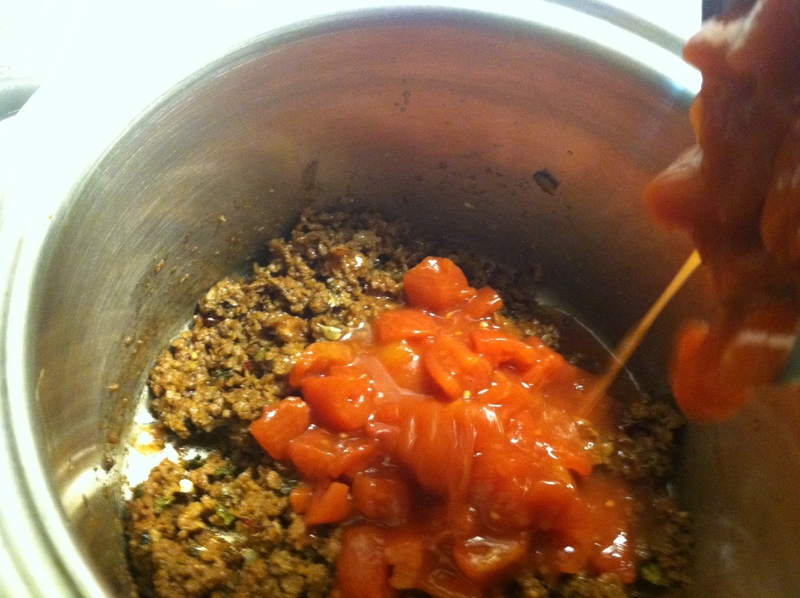 Add more chili powder, garlic, salt ,or cumin to taste for a richer sauce or even a dash of hot sauce! 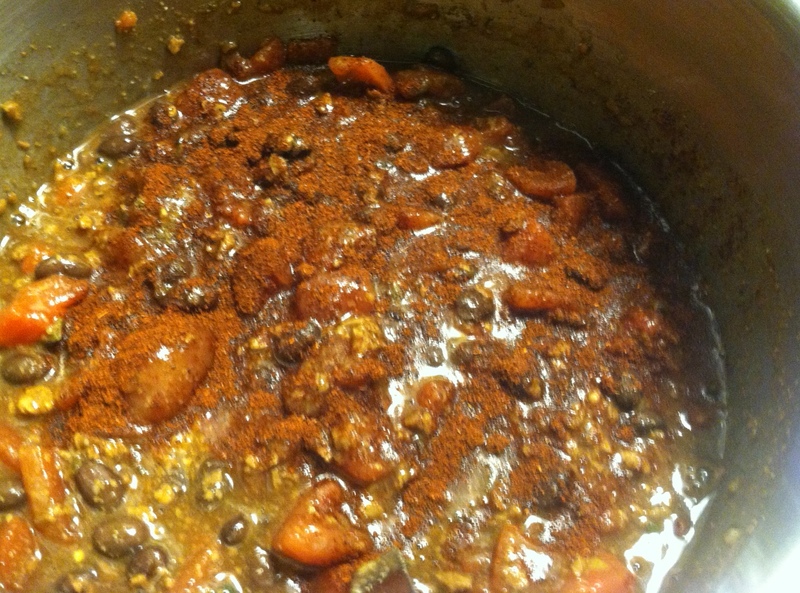 I find extra chili powder and cumin really rounds out the flavor. Use mild or plain chili powder if you are sensitive to spice for the flavor without the heat. Cook down for about 30-45mins. Serve hot with rice, corn tortilla chips, and/or fresh corn tortillas! When I go to work I always keep a few standby items in my drawer. One is everyone’s favorite college favorite: Ramen noodles. I get the “Oriental” flavor of Ramen and leave the dehydrated bricks in my drawer for a fast lunch. However, I am ever so aware of the sodium content and lack of veggies so I usually grab leftover veggies from my fridge and bring them into work so I can make myself a quick ramen lunch. 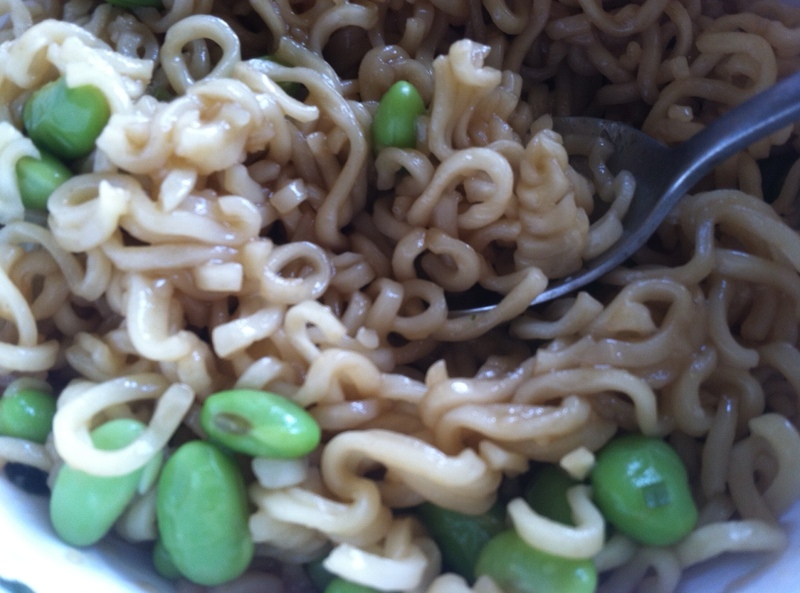 My favorite veggies with the ramen are broccoli and edamame. I will be honest about the fact I do not LOVE edamame but when you can grab it from the freezer and toss it in a microwave so easily and it is filled with protein, I am in. So here is what I had for lunch yesterday. I encourage you to add any veggies you want and maybe even spice it up with some sesame seeds or peanuts or bean sprouts or shredded carrots and make a proper ramen soup (but on the go)! 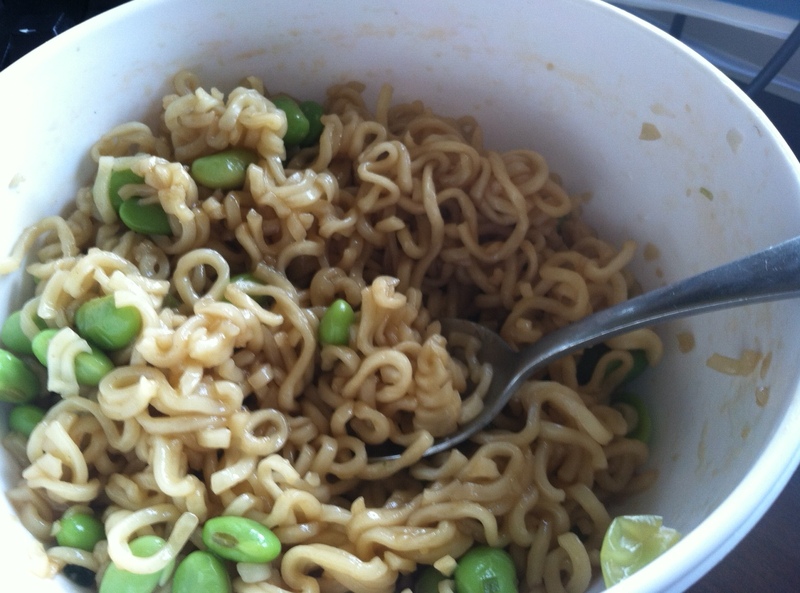 Break up ramen noodles and place in bowl with water. Place frozen veggies with some water or leftover veggies with no water into a bowl. Place both bowls in microwave for 3-4 minutes. Dump veggies into ramen noodle soup and enjoy! Optional additionals: lemongrass, peanuts, bean sprouts, shredded carrots, cabbage, bokchoy, or whatever else you can find in the fridge! I am always on the run. Sometimes I have no idea how I am going to feed my face in the 20 minutes I have until I need to run out the door. I work late most days and after over an hour drive home sometimes nearly 2 hrs, I would rather sleep or just eat crackers instead of cook a meal. Alas, I said to myself at lunch the other day. I know you don’t want to cook anything darling but it is lunch and you need veggies not just carbs. 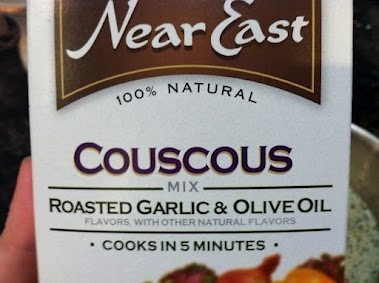 SO I started looking through the cabinets and noticed we had Near East Couscous and grape/cherry tomatoes that were starting to wrinkle before completely going to rot. 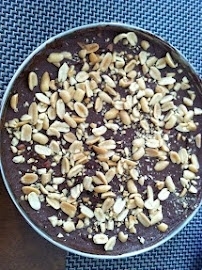 So here is what I made and plan to continue making as it was delicious. 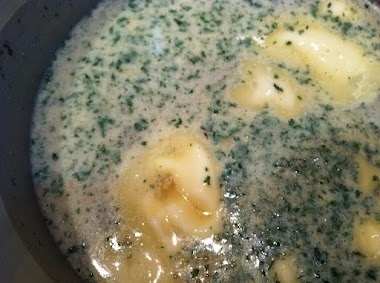 Start by placing water, butter, and flavor packet in sauce pan. Bring to boil stirring occasionally. In a separate sautee pan place olive oil, garlic, and salt. Cook until garlic browns slightly. 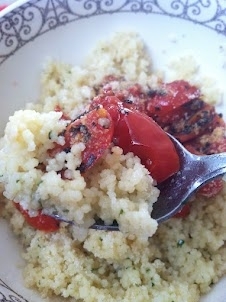 When saucepan is boiling add dry couscous, cover, and remove from heat. 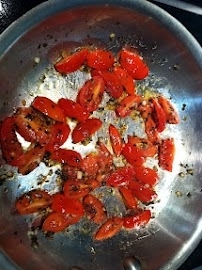 Slice tomatoes into 4 pieces longwise making diamond-like tomato slices. 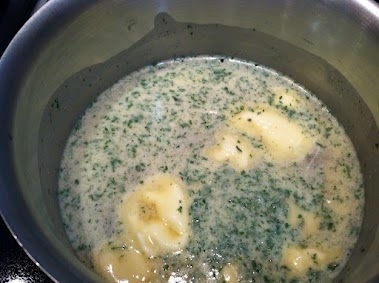 Toss with basil and add to sautee pan. 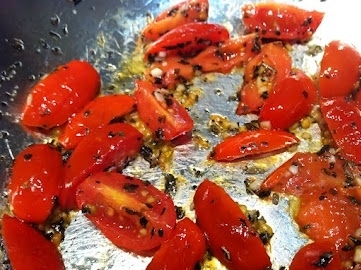 Sautee tomatoes until bright red and basil is browned appearing almost black. 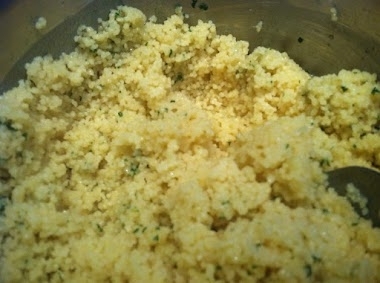 Remove sauce pan lid, fluff couscous and place into a bowl. 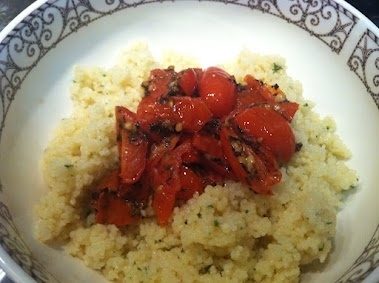 Serve with tomatoes on top. Add a vegan parmesean for an extra kick. I use Galaxy brand. ENJOY! 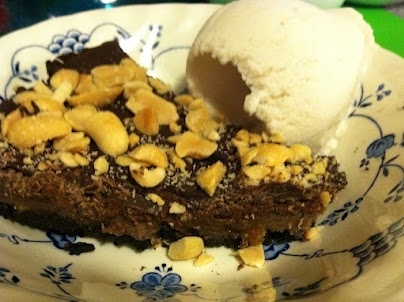 So last night I decided to add a little twist to my Vegan Chocolate Ice Cream Recipe. 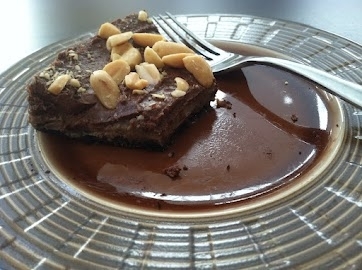 I added an additional tbsp of chocolate powder and as it was spinning in the ice cream maker I drizzled in melted peanut butter. Please try this. Even my husband snuck some from teh freezer around midnight and that’s a compliment from an Omnivore! On Saturday I decided I would attend a vegan conference, my first and only vegan conference to be more specific. I had a few reasons for this. One is that I am not a very good vegan and I should learn the lay of the land. I fell into this by a surgeon’s order not by a love of baby cows on the kill floor of a local veal slaughter-house. In fact my father worked in a slaughter-house for several summers as a young man. I am hardly the one to be an animal advocate. However, it had some courses and speakers that I really wanted to hear. One on vegan blogging and another on cancer and eating vegan. The food demonstrations couldn’t hurt either! What I found when I was there was not what I expected at all, and this was a good thing. I am not thin by any means. After being a half marathon runner turned post-surgery slug. I have gained a bit of poundage that I still am working on eliminating. I didn’t want to be in line with hundreds of skinny, yoga pant wearing ladies in cotton organic blends with vegan running shoes and vegan makeup on their glowing faces. 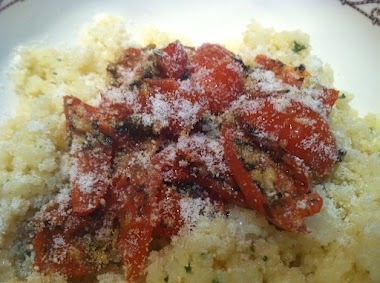 I was a new vegan and I needed comfort in the fact I still didn’t know if my makeup was vegan nor was I caring at the moment because I am still trying to master making a decent Chik’n Parm. 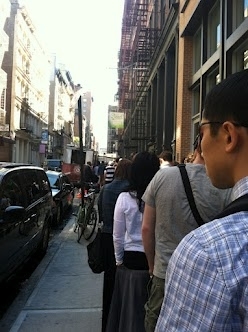 What I did find through the line and the speeches and the demonstrations was a bunch of people just like me. Some unsure of how they got here others precisely sure but most not knowing if they were “doing it right”. The answer from the experts was “probably not but that’s okay because there really is no right way”. Everyone had different reasons and responses. I loved that many were like me in that they got into it for health reasons and the “vegan mafia” that tries to cut down the less vegan strict folks is not the majority. They appreciate anyone who tries because it is a step forward. 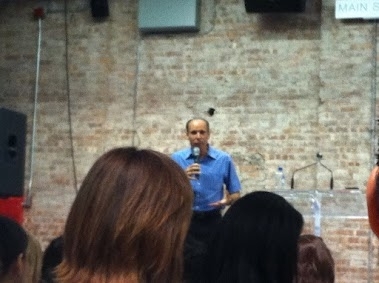 Even Dr. Joel Fuhrman couldn’t totally hate the junk food vegans (ve-junk-atarians) because they were trying. He just wanted to help them become healthier. I responded to this with a whole heart. How do I become a better vegan but more importantly a healthier person? The answer seems easy. G-BOMBS. Dr. Fuhrman says Greens-Beans-Onions-Mushrooms-Berries-Seeds are a partial answer to your anti-cancer nutritional needs. He particularly encouraged if not came close to demanding everyone make sure to integrate nuts and seeds into their everyday diet. These were very important. He also said preparation of the onions was important. You shouldnt cook them and then cut. Cut first then add to your dish. Another chef said to cut them slowly as not to release a ton of the gases because you need these. These are all things I had never learned and I am tempted to get his book “eat for Life”. But I will probably start by reading it in the library as I am forever a skeptic on speeches being marketing campaigns at these things. The good news is I kinds follow this advice already. I made my mother and I muffins the night before for the 4.5hr drive from Boston to NYC for this conference and my muffins were made from bananas, walnuts, flaxseed, canola, flour, chocolate chips, and sugar. 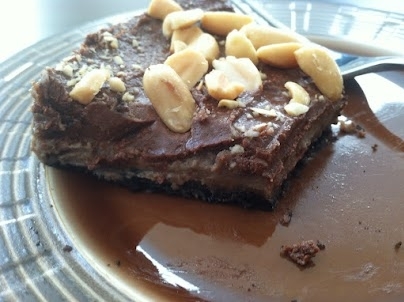 Now I know what the vegan mafia would say SUGAR FLOUR OIL… NOOOO! The point is I am starting. It’s a muffin for God’s Sake. But it has the seeds and the nuts so there. I will work on the rest at lunch or dinner. 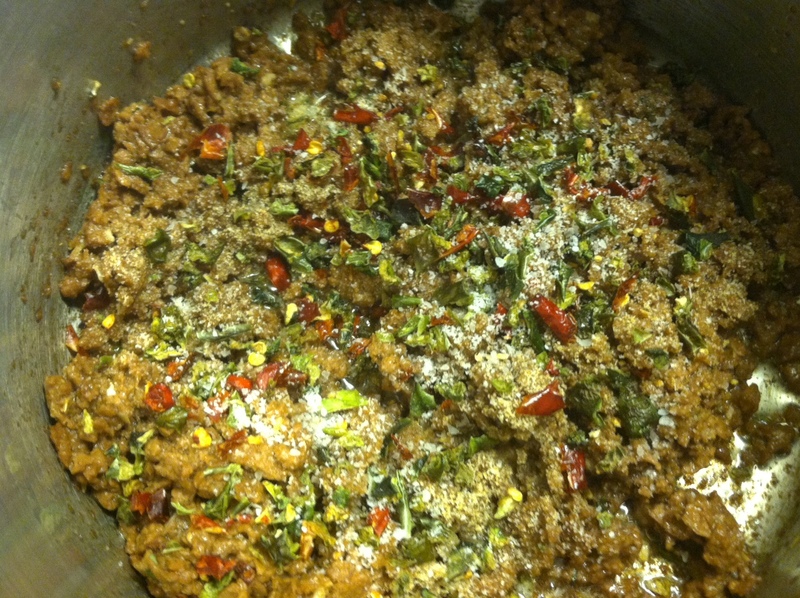 I made a delicious chili that is leftover in my fridge and it has some of Dr. Fuhrman’s favorites in it. 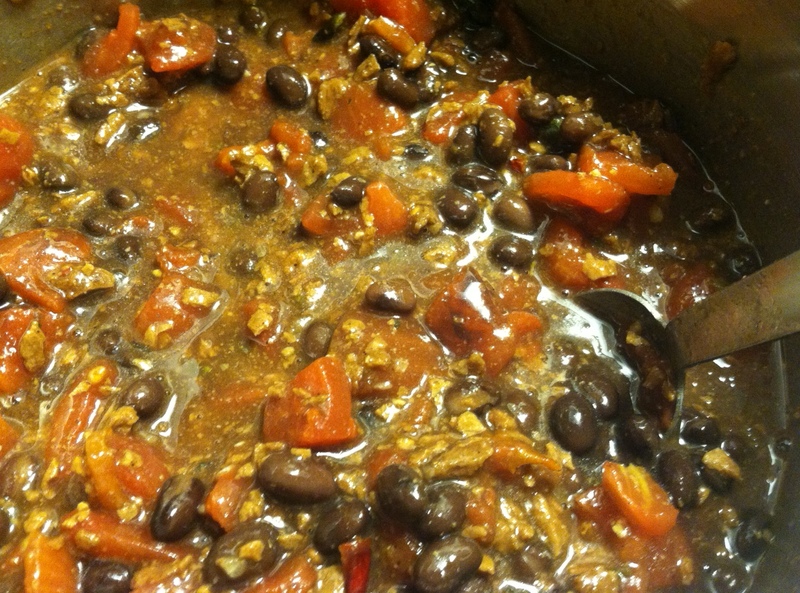 Tomatoes, onions, peppers, black beans, soy meat, garlic, etc. So I have things to get back on track. The best piece of advice I received was simple. Do not try to defend yourself. Simply say “I feel good and this makes me happy”. I found like many others that I was alone when I became vegan and some people were not only resistant but upset by my food choice. I don’t think it was that they preferred the “sick” me but I do think it makes others uncomfortable for some reason. That being said everyone I listened to, did the same thing. Found others online going through this and fought to defend themselves at home. I will never do this again. All I will say is that I am happy, I am healthy, and I feel great. As for food at the conference let me inform you of a few places you need to go! One is the booth that had Queso. 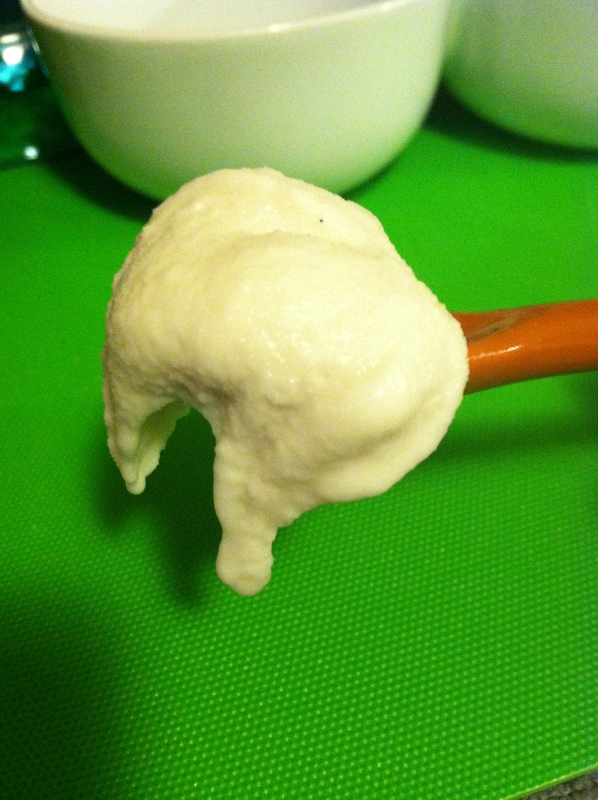 I am hesitant to eat vegan queso as I can never find an amazing cheese sauce. 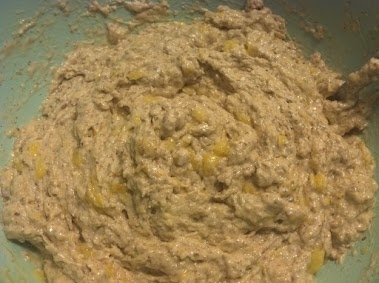 However, try Vegan Queso by www.food-for-lovers.com . 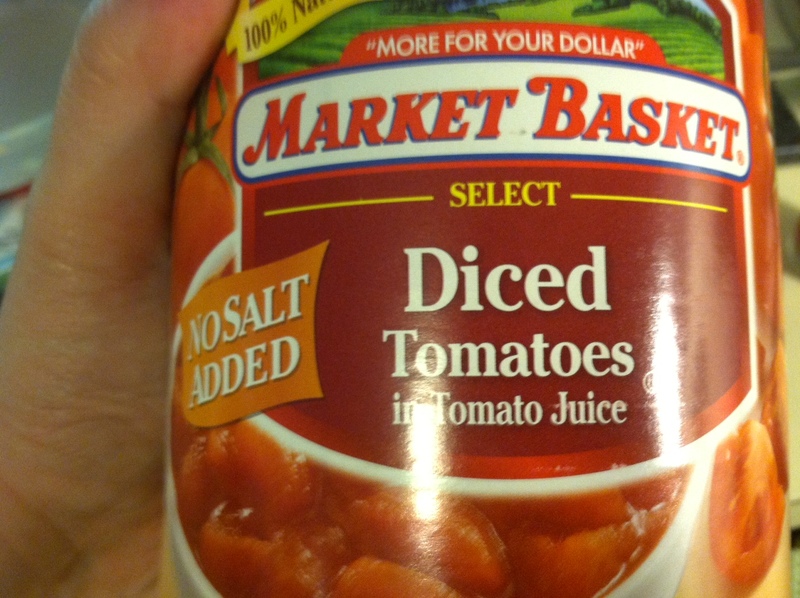 I am officially obsessed and should have bought two containers of it instead of one. There are not a ton of ingredients and I am not sure how it is sooo delish but it is. Another suggestion is to get the Fried Chick’n from local Brooklyn food stop Foodswings (www.foodswings.net). I am in love with it and I cannot imagine how they make it so tasty but they do. It tasted to me like having fried chicken again! Lastly, I missed the MAC’N Food Truck but I heard it was to die for. So try to their Mac n’ Cheez out when you find yourself in NYC. I am going to go back in search! That is all for today folks. I will be sure to give you those Chili and Muffin recipes later this week. Have a Happy Monday! 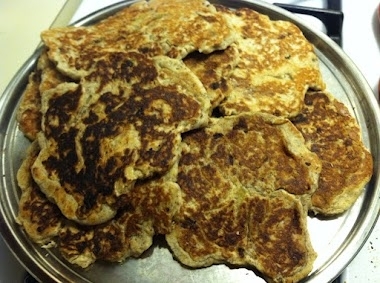 Busy Weeks Call for Pancakes… Banana Pancakes! When I was a kid my father would travel on business a great deal. My mother got in the habitof giving us pancakes for dinner one of those nights when he was away. Usually the night he left. It was about comfort and fun. My brother and I were always beyond excited. She made these enormous, fluffy, bisquick pancakes with a big glass of milk ororange juice and it was like heaven. Since I have been out on my own I realize that when stuff isn’t so fun and life is stressful or when a friend comes in to visit and they arrive late at night, I make pancakes. 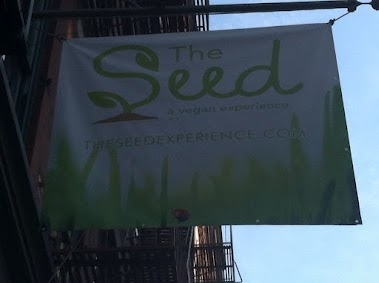 Then the vegan thing happened and I did not know what to eat. Pancakes were butter, milk, and eggs in my head. Then I went online and googled my life away. PETA has agreat site helper called “accidentally vegan” that lists foods you can eat that already happen to be vegan. They have a standard one and teen site with this. And guess what is on it? BISQUICK! 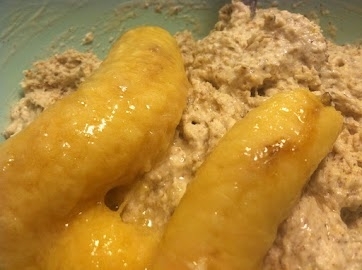 That being said after a long stressful week I am looking forward to pancakesand not just any pancakes I am going all out and making banana pancakes. My non-vegan stepkids love them and occassionally right before I flip them over I will add a few vegan semi-sweet chocolate chips! 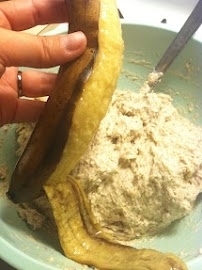 Note: To double the recipe you do not need to double the bananas, I usually just add one more. 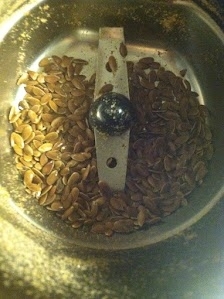 First thing, place the 2tbsp whole flaxseed into the coffee grinder, grind until a fine powder. 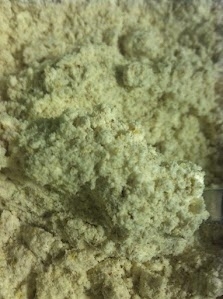 In a large mising bowl mix 2 cups of bisquick and the ground flaxseed together until blended. 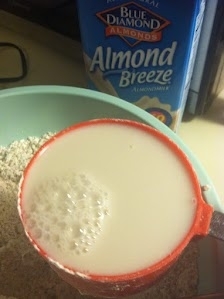 Add the 1/2 cup of both milks to the pancake powder. Stir until thick and sticky. 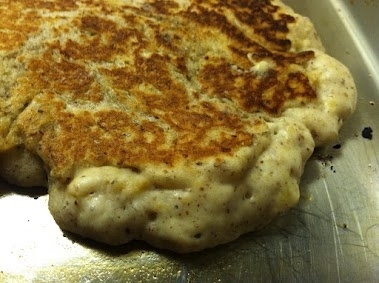 It will be very tough to mix and look more like bread dough than traditional pancake mixture. 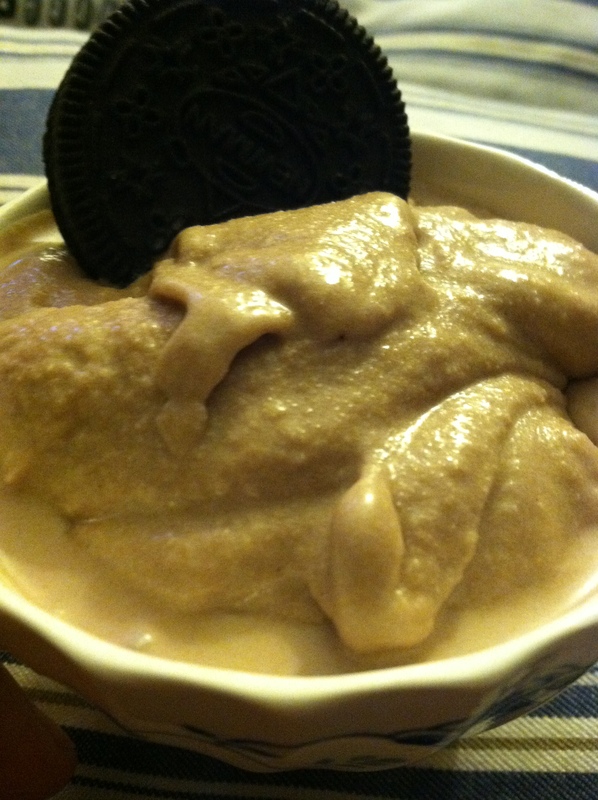 Place browned frozen bananas in microwave for 30secs and then flip and do another 30secs. They will be liquidy so do not remove right away. Add extra 1/4 cup of milk now into the pancake dough. 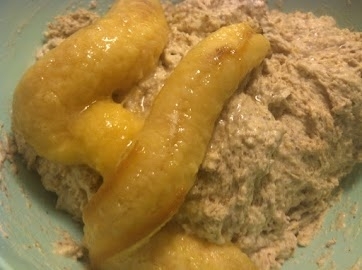 Last add the hot bananas. 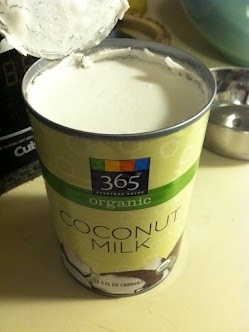 I rip them down the side over the mixing bowl holding them with a potholder and dump them into the bowl. They will be soupy but this is a good thing! 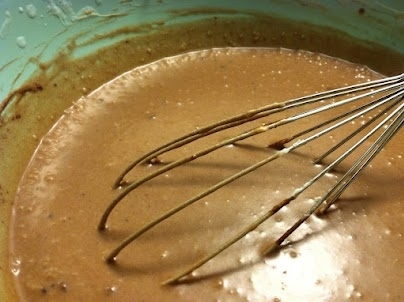 Mash them into the mixture until well blended. Heat the griddle or pan until a bead of water dances on the griddle or pan. Then spray or oil the pan. Scoop pancake mix onto the pan and seperate it using a utensil or you fingers if you are feeling brave until a flattened circle is formed. This may take some practice. If the dough is took thick when you flip it over just press down and flip back after the second side is down to ensure it is cooked through. You won’t die if its not but because there is no worry of food poinsoning but it gets a weird texture. Flip when you see bubbles start to form around the edges. This is the “flip me” signal for those that may not cook alot. Last place them in the oven on warm or about 200-250 degrees until you are ready to serve them all. I top with nuts, berries, heated rice syrup mixed with earth butter and cinnamon, margarine and maple syrup, shredded coconut and sliced bananas, etc. Saturday my husband, 2 setpchildren, and I went to the Museum of Science in Boston (www.mos.org). I am always partially worried/terrified during a trip out because not only do all three of them have a dairy intolerance but I am vegan and that is like being Food Court intolerant. There are apps for what you can eat at the fast food places but sometimes they will list a bread roll, ketchup, and shredded lettuce. 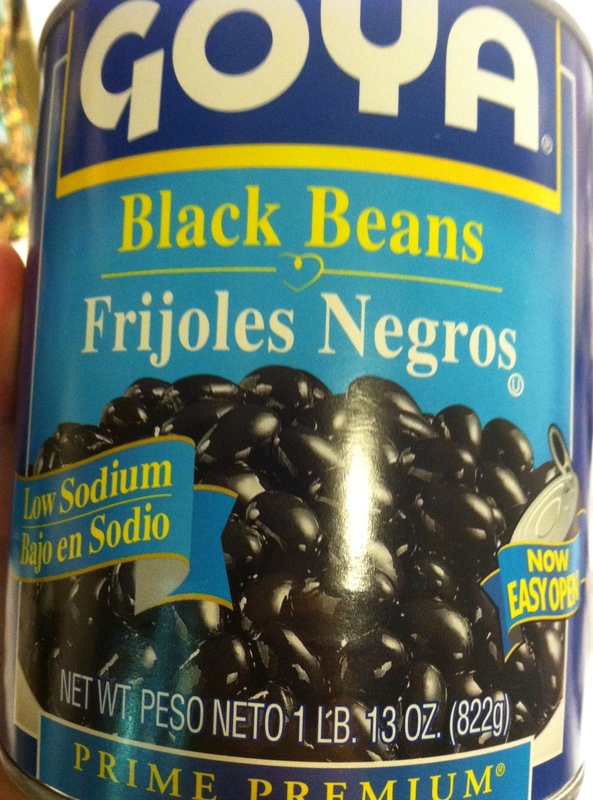 Not exactly a meal or even tempting to want to try. I am not a super vegan either so french fries even if they are in the chicken finger oil do not bother me, I am still on the fence about honey, and I don’t argue over things like what type of sugar is in this soda. That being said I am more flexible when I go out but still not always flexible enough not to pack a lunch and I really can’t stomach too much junk food anymore anyhow. When I got up Saturday morning I made little goodie bags for all of us full of snacks to take to the MOS. Everyone got an apple, a granola bar (minus me, I gave my husband 2 due to a casein issue), and then a cheese danish square I made with the girls the night before (recipe to follow). This was easy and allowed for a decent snack that filled everyone up. However to my suprise they have an amazing salad bar at the Museum of Science in Boston. This is a new thing so I encourage everyone to take a website looksie when going to places like the MOS. They really cater to food allergies and healthy living these days. Especially Science Museums! Also, it is a nice day out to have fun, explore, and learn! Although I do wish they had a bigger section dedicated to food! Lightly butter or oil a cookie sheet and place on of the puff pastry sheets down on top completely rolled out. 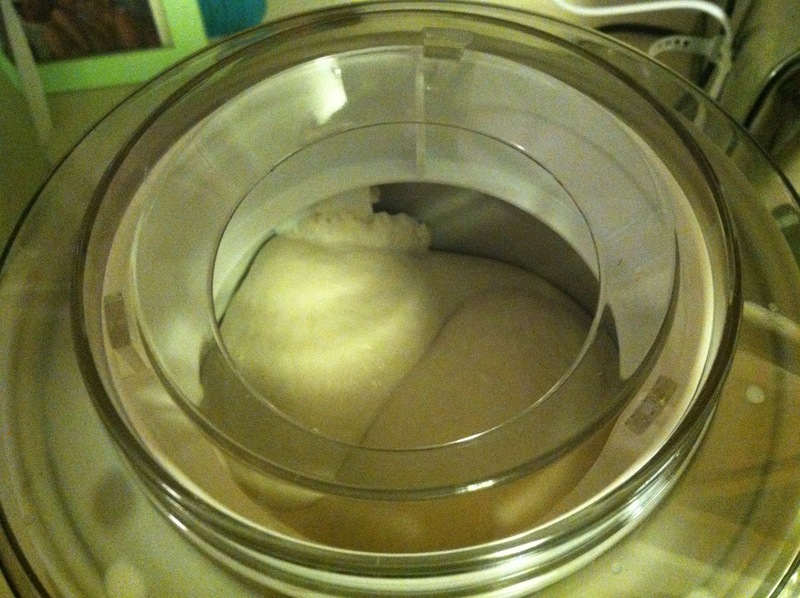 In a medium size mixing bowl combine cream cheese, butter, and brown sugar together. Add cinnamon to taste last. I prefer a whole tablespoon of a mild cinnamon like Ceylon Cinnamon. 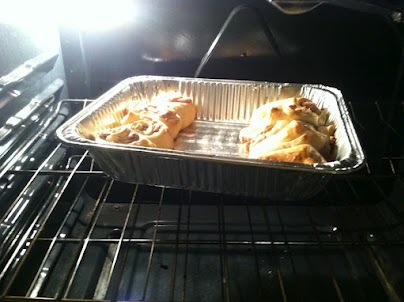 Sprinkle cinnamon on top of the pastry dough. 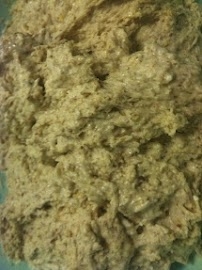 Then top with cream cheese mixture. 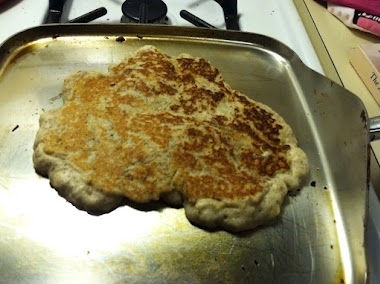 Place the next layer of dough on top. Sprinkly with cinnamon and vanilla sugar or granulated sugar. 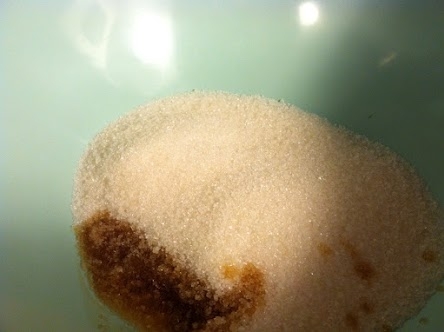 I buy vanilla sugar from Penzey’s, like most of my spices. Place in the oven for roughly 20 minutes or until the pastry is golden and flaky and the filling has melted and is lightly pouring out the edges. Cut with a long flat knife or pastry cutter into squares. Serve slightly warm or cold. Never serve hot as the cheese filling gets lava-like! 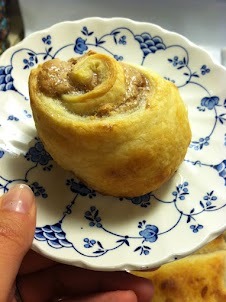 If you want to get fancy you can pre slice the dough into strips and roll it into yummy cheesecake cinnamon rolls!